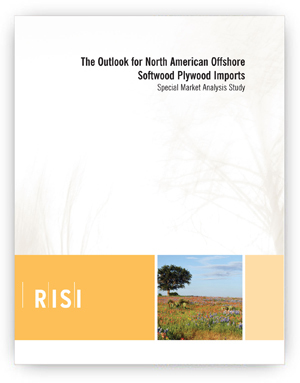 The Outlook for North American Offshore Softwood Plywood Imports - Fastmarkets RISI - Objective Insight. Better Decisions. A two year forecast and analysis of North American plywood imports from Brazil and Chile. Plywood imports from offshore have been rising steadily in 2015 and attracting attention from plywood producers in North America. Imports this year are on target to equal 6.5% of total North American plywood demand, up from 3.2% in 2012. Plywood prices softened in the third quarter of 2015 just as this surge in imports from offshore began to arrive in North America. Trade is an important issue for plywood producers and is likely contributing, at least on the margins, to the third quarter 2015 softness in domestic plywood prices. Despite solid demand growth for recycled boxboard grades over the past decade, virgin boxboard consumption has expanded more rapidly. Steady consumption of liquid packaging and food service board has driven this demand. These grades have fared well in both developing and mature markets alike. Recycled boxboard end-uses, mainly folding cartons, have been more susceptible to substitution by alternative packaging materials such as plastic. This has created some headwinds compared to virgin boxboard grades. 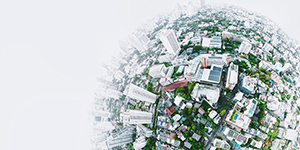 Fiber limitations in many regions, has also led to the rapidly escalating trade of virgin boxboard from fiber rich regions of North America and Europe to fiber poor regions. Brazil in particular has been playing an increasingly larger role in the US import market. Exports to the US accounted for just 8% of Brazil’s total for 2014. However, in the first nine months of 2015 that share surged to 16%. Chilean exports to the US have also been rising with the full ramp up of Arauco’s Nueva Aldea plywood mill in early 2015. 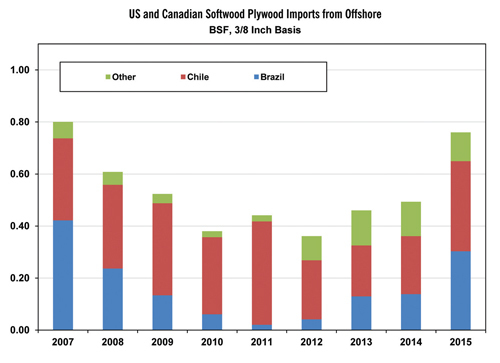 The Outlook for North American Offshore Softwood Plywood Imports examines the potential for offshore imports through 2017 given current domestic plywood pricing levels in US dollars, Chilean Pesos and Brazilian Reals. The study will help producers and investors understand the potential for more North American imports from South America in the next two years given current capacity and production levels in Brazil and Chile. It will also incorporate a total offshore import forecast with an augmented look at import levels by country.